Kudos can help with your niche needs, by providing a bespoke solution, to ensure you have a space that strikes the perfect balance between aesthetics, suitability and functionality. Each bespoke project starts with a blank sheet of paper, we have no preconceptions about the design or materials we take you brief and understand what’s is required. We have created strong working partnerships with a various manufacturers (mainly UK based) which all have different skill sets. Kudos’ technical knowledge will enable you to turn your ideas into reality. Glacier white Corian® worktop scribed and seamed along all four walls of 9m x 6m room and around existing column. Built in perimeter storage with Diamond Black laminate doors on ‘soft close’ hinges, integral cable management and feature LED plinth lighting. Fitted wall panelling in satin Viola Formica® laminates with LED uplit and down lit Alpino White laminate central feature section on stand off fixings. 800mm diameter curves at all room corners. 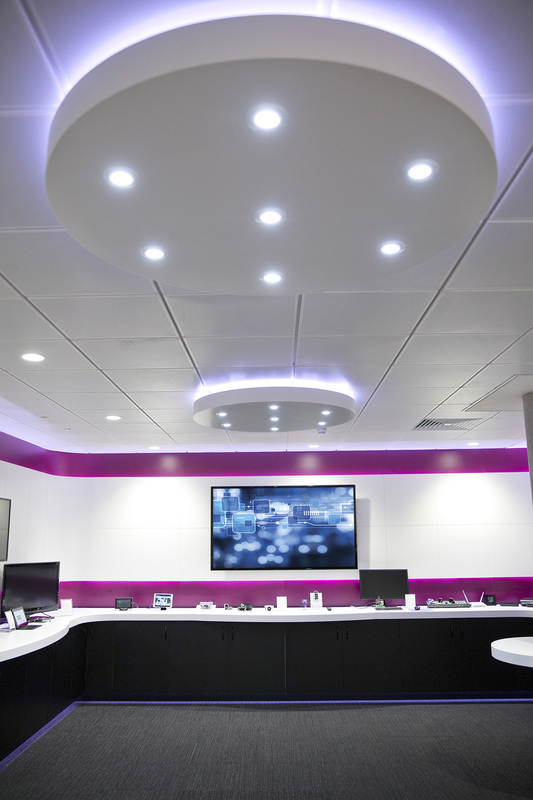 2 x 1200mm diameter feature LED ceiling mounted lighting units finished in white satin lacquer. In a recent project, we helped a client who had a limited amount of space and had various requirements. 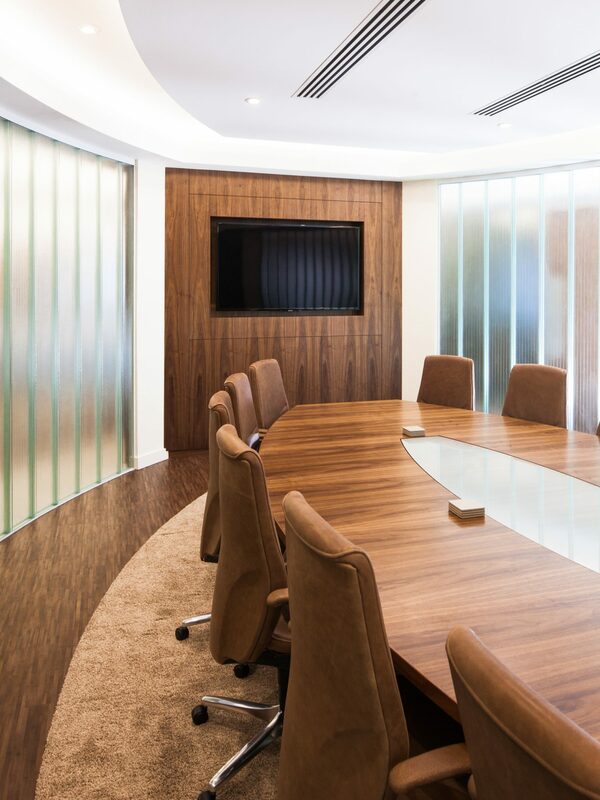 We created a multi-use space, which provides them: one large boardroom; which splits into two individual meeting rooms; or a full room theatre style setup. 13m long four section modular table in walnut veneer with undercut chamfered solid walnut edging and walnut veneer power data access flaps. Discreet doors in walnut veneer table bases for access to concealed castors. 2.4m wide, four doors bespoke unit in walnut veneer, housing fridge unit and audiovisual rack. 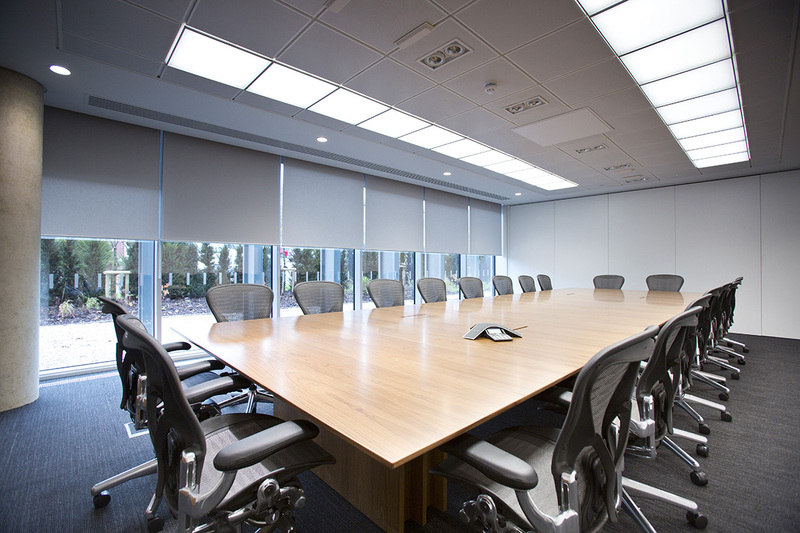 To discuss your project please contact us on 0845 177 0565, or enquiries@kudosinteriors.com. Time to make a stand?